Vetomile R310 dual dash cam equipped with front and rear dash cam, clear wide-angle lens helps monitoring your driving in all domains. Built-in GPS system which could record driving history completely. Advanced G-sensor is available, it could lock the recording automatically while there is a wrong car moving appeared. What's more, set your private code of recording file, and protect those evidence effectively. 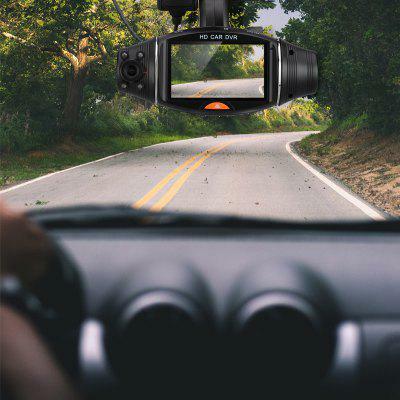 ● Built-in dual dash cam, recording the front and rear view at the same time so that remove your any inconvenience. ● Wide-angle lens adopted with flexible design, which could be rotated in up to 270 degree. Much more visible range than ever before. ● Special GPS record system, track your driving history via Google map. It builds the powerful data base for you analyzing the driving history. ● Professional continuously recording enhanced the main performance of R310, never miss one second from now on. ● Data safety could be guaranteed by the built-in protection function. Set your private code for your files so that control all evidence now. ● Automatically recording and delayed recording functions are available, which achieves the convenience of hands free. In addition, protects your car from power pulse. ● R310 equipped with Photosensitive components so that improve the performance of recording quality. Images will be clear even in a dark environment. Want to be notified when the VETOMILE R310 HD Car DVR Rotatable Wide-angle Lens Automobile Data Recorder gets even cheaper? Make sure you snag the best price by entering your email below. We'll email you when the price drops, free! We're tracking the price of the VETOMILE R310 HD Car DVR Rotatable Wide-angle Lens Automobile Data Recorder every day so you know if that deal is really a steal! Check back for to check the best price for this product - and whether its current sale price is really the cheapest it's been! No VETOMILE R310 HD Car DVR Rotatable Wide-angle Lens Automobile Data Recorder coupons found!